SALT RIVER PIMA-MARICOPA INDIAN COMMUNITY – Taking U.S. Interior Secretary Sally Jewell on a tour of his school Tuesday, sixth-grader Christopher Manuel demonstrated a robot he built with a team. “I enjoy working with robots the most,” said Manuel, student body president of Salt River Elementary School. Jewell’s visit, billed as a listening tour, was part of Generation Indigenous, President Barack Obama’s plan to improve the lives of and break down barriers for Native American youth. Greeting an assembly of students, Jewell asked them how to say certain words in O’odham, the native Pima language. And what their favorite food is. Some said pizza and ice cream. Others said fry bread, a more traditional snack here. Manuel then took Jewell on a tour, showing how the library was preparing for a book fair and pointing out tablets that were purchased with a grant to promote science, technology, engineering and math instruction. An aspiring archaeologist, Manuel said later that showing Jewell the robots was his favorite part of the tour. Jewell said visiting the school is a good way to understand what is and isn’t working at Bureau of Indian Education schools. She later visited a school on the Gila River Indian Community that she said hadn’t been funded as well as the one here. Jewell said that despite programs like the ones available here Bureau of Indian Education schools are in dreadful condition. According to 2014 White House report, more than a third of American Indian and Alaska Native children live in poverty. Their high school graduation rate is 67 percent, the lowest of any ethnic group across all schools. “In many ways we are failing these children,” Jewell said. Jewell said that since visiting Indian Country last year the president has been urging his cabinet members to meet with Native American youth. “We have acknowledged that we have not done a good job with Native youth,” she said. Monty Rouessel, director of the Bureau of Indian Education and a member of the Navajo Nation, said he would be working with the federal government to address a shortage of funding. “We are looking into the issue, studying ways to fund these education programs,” he said. 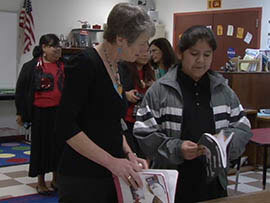 Touring Salt River Elementary School on Tuesdar as part of a Native Youth Listening Tour, U.S. 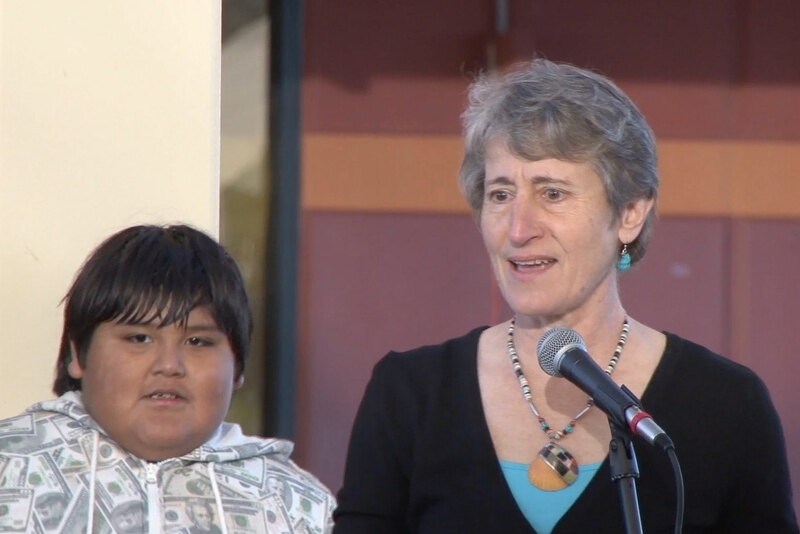 Interior Scretary Sally Jewell got an earful from students about their school's successes but also about the federal government's response to problems. U.S. 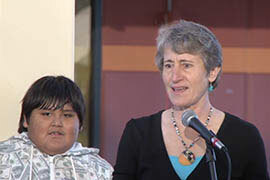 Interior Secretary Sally Jewell addresses students during a visit Monday to Salt River Elementary School in the Valley. Sixth-grader Christopher Manuel takes U.S. Interior Secretary Sally Jewell on a tour of Salt River Elementary School in the Valley.